(Nanowerk News) For the first time ever, scientists have determined the cosmic origin of highest-energy neutrinos. 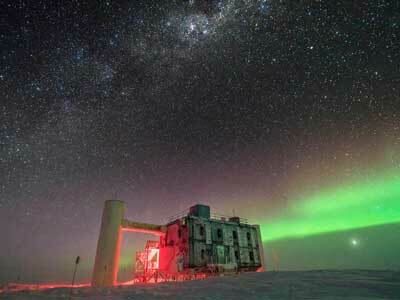 A research group led by Prof. Elisa Resconi from the Technical University of Munich (TUM), provides an important piece of evidence that the particles detected by the IceCube neutrino telescope at the South Pole originate from a galaxy four billion light-years away from Earth. To rule out other origins with certainty, the team led by neutrino physicist Elisa Resconi and multi-wavelength astronomer and blazar expert Paolo Padovani from the European Southern Observatory (ESO) examined a 1.33-degree sky region around the position that a high-energy neutrino that hit the IceCube detector on September 22, 2017 emanated from. An international cooperation involving Resconi had associated the neutrino to a known blazar with the catalogue number TXS 0506+056 – an active galaxy whose jet of high-energy particles points directly towards Earth. “It is one of the brightest and most peculiar objects ever observed,” says Elisa Resconi. For their work the research group led by Resconi and Padovani used, for the first time ever, the open access archive data of "Open Universe", an initiative under the auspices of the United Nations Committee for the Peaceful Uses of Outer Space developed by astronomer Paolo Giommi, currently a Hans Fischer Senior Fellow at TUM-Institute for Advanced Study. Using specially designed software, they combed the data from multiple telescopes to characterize the signals. Initially, they found 637 objects, including seven blazar-like objects that might be responsible for the IceCube neutrino. Then, they took a closer look. After careful analysis, only one of the blazars in question was left. This object stood out as a particularly strong source of high-energy gamma radiation during the period from September 2014 to March 2015. During this time frame, IceCube detected further neutrinos emanating from the region of TXS 0506+056, as revealed by a subsequent investigation of all previous IceCube neutrinos since 2008. "However, our work conclusively shows that the radiation profile of TXS 0506+056 perfectly matches the energies of the neutrinos, so that we can exclude all other sources", says Paolo Padovani. In 2017, Resconi, Padovani and Giommi were the first to connect high-energy IceCube neutrinos with blazars. "Now we can make a decisive contribution to demonstrating that blazars are the sources of cosmic neutrinos," says Elisa Resconi. For Resconi, the end of an over one-hundred-year-old search for origins of high-energy cosmic particles also marks a new beginning: "We now know better what to search in the universe". Neutrinos are the only cosmic messengers that open the door to the highest energy phenomena in the universe. Neutrinos, however, are extremely volatile particles. Since they barely interact with matter, neutrinos pass through virtually every kind of matter unhindered. Even though the IceCube detector with its volume of one cubic kilometer in the Antarctic ice is the largest detector in the world, it is still too small: Since 2013, IceCube has observed only 82 high-energy neutrinos. That is why Elisa Resconi is working on the design of a network of neutrino telescopes distributed across the Earth. The goal: To increase the number of detected neutrinos so that scientists can do real astronomy to further explore many hitherto poorly understood phenomena of the universe in combination with the other astronomical messengers – electromagnetic waves and gravitational waves. At the end of June, Resconi’s TUM team successfully launched a brand-new project: In the north-eastern Pacific Ocean, at a depth of 2.7 km below the surface, two 150-meter-long strings with a total of eight detectors were deployed on the sea floor.